WE FIND THE RIGHT PEOPLE TO FIT YOUR REQUIREMENTS. We will not waste your time and money by sourcing the near-qualified people. We source consultants with varied skills to furnish your IT needs and we have Tech. Savvy Recruiters to identify the best fit. If none of our own consultants is a good match for your requirements, then we use multiple sources including job boards to get you the best candidate. “Half the Solution Lies in Understanding the Problem”. Our Account Managers and Recruiters are well qualified and Tech. Savvy to understand job requirements so that the best matching candidates are sourced. Our Technical Recruiters are hired not only based on their recruiting experience but also in their specialty areas. For instance one of our recruiters is specialized in ERP recruiting has knowledge on technology, modules, implementation, and production support of PeopleSoft, SAP, and Oracle applications. This knowledge helps them to understand the job requirement so that the matching candidate can be found. Our Tech. Recruiters are constantly updated with technology changes in their specialty areas via external training or self study. Our recruiters and account managers are constantly in touch with our existing consultants to make sure they are up to client managers’ expectations. This knowledge of client managers’ expectations and requirements is used to assess candidates for any new positions. Pre-Screening: Since our recruiters are tech. 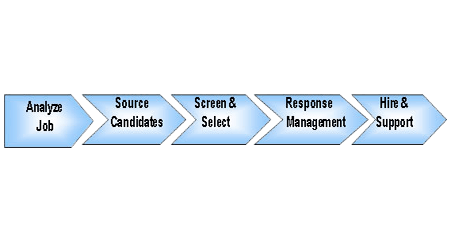 savvy and understand IT process in general they are well equipped and qualified to pre-screen the candidates. This is first-level screening that will be followed by second-Level screening. We use product specific questionnaire developed by our own senior consultants in each of their respective fields. Screening: As a second-level screening our Sr. consultants in their respective fields interview the candidates and provide their assessment to the recruiters and account managers. As each resume sourced is reviewed and the candidates interviewed each skill is assessed and recorded in our “Skills Match Grid” template. As each candidate is pre-screened and screened, any additional skills related information obtained that’s not provided in resumes is also recorded in “Skills Match Grid” and the candidates are advised to update the resumes accordingly. Our Account managers who maintain client relationship are experienced recruiters and IT Professionals who are apt in interpreting client needs and providing exactly the right resource selection in a timely manner. Each candidate’s resume sent to you is associated with a “Summary Skills Sheet” that will give you highlights of each candidates skills and experience. When we are sending multiple resumes for a position the summary sheet will also provide you with our assessment of comparative skills of each candidate. Service quality is maintained by ongoing performance reviews with consultants and clients after they are placed. If a consultant is not able to provide expected service, we will immediately replace with another qualified consultant. Once placed a consultant is provided with the support by other consultants in the domain expertise to do his/her job well. Our staff policies are strong enough to keep the consultant throughout the client project. .